As anyone who has experienced the joys of the Scottish countryside in summer will tell you, the weather can usually be pretty fickle. Bright sunshine can quickly give way to short, sharp rain showers. The last thing you want to be carrying round, however, is your heavy winter waterproof, particularly if it is going to spend most of the day stowed at the bottom of your rucksack, popping out for perhaps just 10 or 15 minutes protection from a passing downpour. This is where lightweight waterproofs come into their element. They pack down into tiny bundles, yet offer you all the protection you need for three-season hillwalking. Weight is dispensed with by cutting out unnecessary features and sticking to the basics - a waterproof shell and a good hood. Lightweight jackets are, on the whole, cut shorter than their winter counterparts, which also make them ideal for mountain biking, cycling, trail running or just walking the dog on a blustery autumn evening. We've put nine models ranging in price from £40 to £240 to the test in a range of conditions and across various activities, primarily hillwalking and mountain biking. As you would expect from modern gear, all performed superbly on the waterproof and windproof fronts while breathability varied across the range. The Berghaus is the most expensive of the jackets in our test and is made from Gore-Tex Paclite, the lightest and most breathable Gore-Tex fabric. On the breathability front, it performed extremely well across a range of activities, from vigorous walking to mountainbiking. Not once was I left with condensation on the inside. The Paclite is a little stiffer than other fabrics initially but it soon softened through wear. 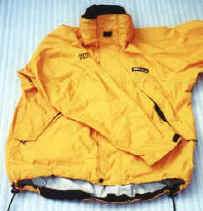 There are two zipped pockets which are mesh lined and can be left open for ventilation. They are big enough for maps. The hood provides great head cover and has a stiffened peak and volume adjuster. It also moves round well with the head. The zip is covered by a single flap, fastened down with Velcro and a single stud at the bottom and the cuffs are also adjusted using Velcro. A mesh stuff sac is provided for storage. Low weight, excellent breathability. Expensive but worth every penny. Weight: 475g. Sizes: S-XL. £240. The second of our test jackets to feature Gore-Tex Paclite fabric, the Phantom is extremely light in weight and packs down into a very small bundle indeed. Breathability is excellent. You hardly notice the hood when its rolled away in the collar but when it comes out it does an excellent job. It has a volume adjuster and stiffened peak. There are two zip-closed chest pockets which sit well above the waist strap of a rucksack and both are large enough for maps. We read another review on this jacket which suggested the Phantom is short lengthwise but this wasn't a problem we found. 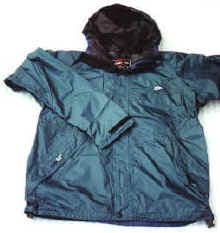 The front zip is covered by a single Velcro flap and stud in the same way as the Berghaus and the cuffs are half-elasticated and have Velcro. It packs into its own pocket for storage. Very low weight with fantastic breathability. Weight: 395g. Sizes: S-XL. £200. 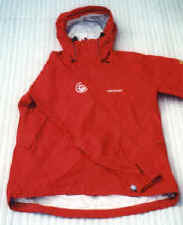 The Skyline jacket was first taken out on a fair but blustery day in Glen Prosen, Angus. It is a supremely lightweight garment which folds into a very small bundle inside a stuff sack. 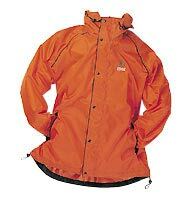 It's constructed from 2-ply Ascent Goretex with mesh lining. It certainly kept out the wind, keeping me comfortable on the mountain tops with just a polyester t-shirt on underneath. The Skyline also benefits from an inside map pocket, foldaway hood and two outer zip pockets. The main front zip also has a Velcro fastening outer flap. The fit is excellent and the close-fitting hood, which has a stiffened peak and volume adjuster, turns with your head preventing the material from blanking your vision. The front zip is covered by a single flap, fastened with Velcro and there's Velcro on both cuffs. The Skyline is low in price for a Goretex jacket, the weight is good and the performance excellent, making it an great choice. Weight: 555g. Sizes: S-XL. £150. Identical in design to the Skyline, the Drilite Plus is lighter and, pricewise, cheaper. But it retains a lot of the design features that make the Skyline such a good jacket. The fit is excellent and the soft fabric means it is very comfortable. The rollaway hood with stiffened peak and volume control provides excellent protection, moving well with the head While the Skyline has a Gore-Tex shell, the DriLite Plus is made from DriLite coated ripstop nylon, again with a mesh lining. 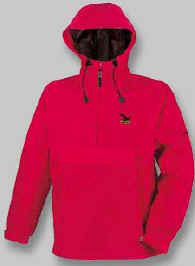 The breathability is not as good as its more expensive sister, but remains better than other similarly priced jackets. There are two waist-level pockets and one internal one big enough to accommodate a map. The price makes this a very good choice for three-season walking. Highly recommended. Our best buy. Weight: 530g. Sizes: S-XL. £80. Lowe Alpine's Triplepoint technology is used on this jacket which means that the fabric is designed to keep out water in all three forms - rain, vapour and ice. The breathability was good and the weight extremely light. 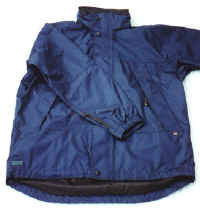 The jacket has the usual adjustable Velcro cuffs, two large front pockets and foldaway hood with volume adjuster. The hood design is not as advanced as the ME Skyline but is does have a small brim to keep dripping water off your face. There are no interior pockets - just two chest pockets which are big enough for maps - and drawstring adjustment is available on one side only. This jacket is aimed primarily at the trail runner and mountain biker and the minimum of features keep weight right to the minimum which, combined with the price, make it a very good summer package for hillwalkers too. Weight: 360g. Sizes: S-XL. £80. We were extremely impressed by the Wynnster Nevis tested in our winter waterproofs feature and the Packaway didn't disappoint either. Although the heaviest and bulkiest of the tops tested here, it still packed down into a nice tight package and comes with its own mesh stuff sack. The Packaway is made from a nylon shell coated with Aquastop, a waterproof and breathable fabric which did its job admirably. Features include two good-sized chest pockets that sit comfortably above a rucksack waist strap. These are zip closed and are big enough to accommodate a map. The peaked hood rolls away and has a drawcord adjustment round the neck, stiffened peak and volume adjuster. The hood is cut to ensure it doesn't obscure visibility when the head is turned. The main zip has a double storm flap over it, secured with studs and Velcro patches, and there's a drawcord on the hem while the cuffs are half-elasticated with good sized Velcro tabs. Good quality feel, a good overall cut and very comfortable. It you're looking for something lighter, there's the Wynnster Stowaway. Weight: 800g. Sizes: S-XL. £50. 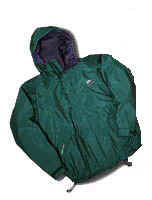 The Pakka Trek is made from Aquadry-coated ripstop nylon fabric which is waterproof and breathable and this jacket is fine and light, rolling up into a tight ball. It has two low front pockets with zip fastenings, covered by Velcro flaps and these sit comfortable below any rucksack waist strap. There's also an internal pocket big enough to take an OS Landranger and this has a good sized zip tab on it. The main zip is not as chunky as others but again there's a good sized puller. Over the zip there's a double storm flap with studs. The roll up hood has a volume adjuster and stiffened peak and there's a reflective strip on the back, a handy touch particularly for cyclists. The hood itself moved fairly well with the head although the initial adjusting was a little fiddly. The cords are nicely concealed. The Pakka Trek is supplied with a mesh stuff sac for storage. Lightweight, good spec and very good value. The only thing we weren't particularly taken with was the light metal zip at the front. Chunkier plastic would be better. Weight: 400g. Sizes: S-XL. £50. A good budget jacket designed specifically for three-season hillwalking from this Scottish manufacturer. The cut is good and the fit comfortable. The front zip is protected by a double flap and studs and there's a good hood with wired peak which rolls away into the collar. There are two chest pockets capable of taking maps, drawcords on the hem and hood and a stuff sack. 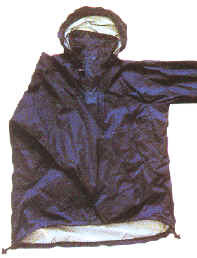 The Rainlite is made from Storm 3000 hydrophilic breathable coated fabric with a mesh lining but breathability was somewhat limited when the jacket as worn for long periods of walking. However, the weight is good, the cut is one of the best for hillwalkers and the price makes it a very good buy indeed. Highly recommended for the budget buyer. Weight: 515g. Sizes: S-XL. £40. A waterproof, overhead top designed for sports use. Features include a rollaway hood with visor, single-handed drawcord and volume adjustment, a hem drawcord and adjustable cuffs. There's also a large zipped chest pocket. The jacket compresses into this and can be worn around the waist using the elasticated belt. The material is a Powertex membrane with nylon shell and mesh lining. Weight: 420g. Sizes: S-XXL. £79.95.